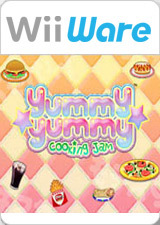 Yummy Yummy Cooking Jam is a frenetically active cooking game in which you have to serve the food your customers order as quickly as possible. This could be a simple task, but the customers aren't very patient, and you'll find a multitude of annoying insects that make the noble mission of satisfying your small gourmets' stomachs much more difficult. In the game's Career Mode, your goal is to become the best chef in the city. To do so, you have to prove your worth, cooking in four fantastic restaurants: the Hot Dog, Hamburger, Pizza, and Mexican Restaurant. Enjoy playing Yummy Yummy with your family, serving delicious food to the most surprising characters: vampires, ninjas, extraterrestrials, and mafia thugs. Put on your chef's hat, sharpen your knives, and turn up the heat on the stove, because you have to show the entire world who the fastest, most skillful chef is. Emulator will produce following errors following the Wii safety screen after which emulation will freeze. Refer issue 9446. The graph below charts the compatibility with Yummy Yummy Cooking Jam since Dolphin's 2.0 release, listing revisions only where a compatibility change occurred. This page was last edited on 12 January 2018, at 10:13.